How do I customize the File menu in a RibbonWindow? I have a QuickAccessToolbar, but the icon that normally has functionality like "Minimize," "Maximize," and "Close" isn't there any more. If you are allowing Scenic layout (new in 2010.1 and is now the default), then you will see the icon there with the menu as long as you specified a Window.Icon. 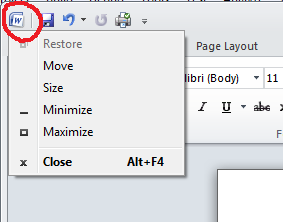 If you turned Scenic layout off (thereby using the Office 2007 style of app button) then the system menu icon only shows when the ribbon is collapsed, which matches Microsoft's specifications.